Three groomsmen head to Vegas for a bachelor party with their best friend two nights before his wedding. After one hell of a night in Vegas, the three groomsmen wake up to find the groom missing and barely any memory of what happened the night prior. The three friends must band together to retrace their steps, find their best friend and get him home safely in time for his wedding. 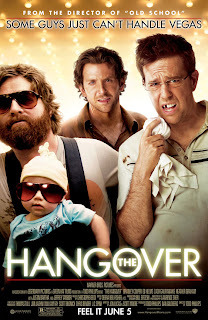 "The Hangover" is a delightfully hilarious comedy that despite a few lulls in momentum, really delivered on laughs and enjoyment. The story itself, is inherently simple and ultimately predictable, however any negatives easily become out-weighed by the outrageous situations and quality performances presented on screen. "The Hangover" will shock you, make you laugh hysterically and most of all leave you walking away with a huge smile and a strange desire to go to Vegas. Director Todd Phillips reminds us why we loved his directing in the past and comes close to his best work in Old School. The director creates far superior work to his previous two films School for Scoundrels and Starsky & Hutch in "The Hangover," a film that is sure to become a instant classic being enjoyed countless times. Phillips and his cinematographer Lawrence Sher, do a wonderful job of capturing Vegas in the alluring light it is known for and furthermore, use locations including Caesars Palace to effectively create that nostaglia and commonly known line of, "What happens in Vegas stays in Vegas." On a side note, Todd Phillips cameo in "The Hangover" was absolutely hilarious and a perfect representation of some of the random things you'd see in Vegas. The performances throughout "The Hangover" are ridiculously funny and do a oustanding job of diverting the viewer from the predictable story. Zach Galifianakis easily steals the film. Galifianakis is a joy to watch on screen. His character, his mannerism's, his deliveries and his dialogue throughout are all perfect. Nearly every moment he is on screen he produces some a simple look or line that would instantly garnish at least, a chuckle. His line to Tyson, "Maybe I should wait outside," was priceless and it was only one of many memorable laughs delivered by Galifianakis. Ed Helms plays Stu Price, a character that is nearly a mirror image of his character Andy on NBC's The Office, but irregardless his performance his was risible. Helms's singing montage's (like in The Office) were some of his more humorous moments however, he gives the best performance during the morning after scene. Anyone who has had a rough night of drinking will get a kick out of the look on his face and the camerawork utilized to match the daze he wakes up in. Bradley Cooper does a good job of breaking away from his douchebag role's of the past (most notably in Wedding Crashers) although, he is given the least funny character in the film. Cooper as Phil, is the rock of the group, trying to center both Stu (Ed Helms) and Alan (Zach Galifianakis) from their antics or dilemma's while trying to retrace their steps. While his character does provide a few laughs, in comparison to Helms, Galifianakis and Ken Jeong, Bradley Cooper is outshined. Ken Jeong is a riot in "The Hangover" as Leslie Chow. He has a very minor character, however his moments on screen are some of the most shocking and zany of the film. Sadly, most of the Mike Tyson scenes were already revealed in the trailer, so it lost a bit of it's luster, however Tyson does still give a rising performance. Overall "The Hangover" was a side-splitting success. The film definately delivers and has you laughing more times than not. The antics the groomsmen get themselves into while re-tracing their drunken evening are absolutely ridiculous, but ultimately a true joy to watch on screen. The performances are perfect and the final closing credit montage really is an added bonus. "The Hangover" is absolutely worth a watch and will be most enjoyed amongst a group of friends.